If you have pictures you want to share for a Post, Auxilary, or S.A.L. event, please send them to pewaukeepost71@gmail.com and we will get them uploaded. 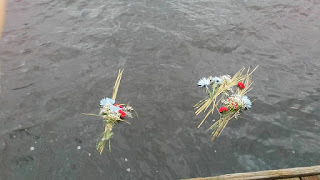 On May 25, 2013, we added a memorial to the Veterans of All Wars. On May 28, 2016, there was a re-dedication ceremony for the addition of many new memorial bricks. 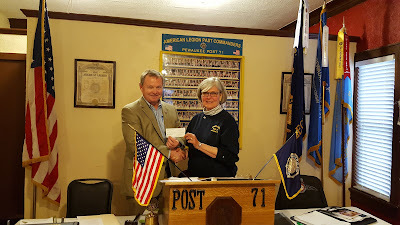 On May 8, 2017, we presented the USO Wisconsin President Daniel Toomey with a $1000 donation for his organization. 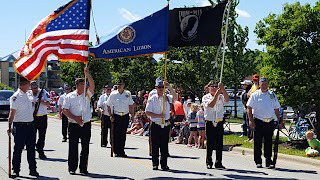 Annually, the American Legion Family at Post 71, participates in the Memorial Day Parade through downtown Pewaukee. A memorial dedication is made to those who sacrificed their own lives for us. Benjamin Clark was our first Post Commander. Click the Post Commanders link to see all post commanders, past and present, and their dates of service.